In New Python, the Weeper is deleted as soon as its thread dies, and __del__ runs on the dying thread. In Old Python, the Weeper isn't deleted until the thread is dead and a different thread accesses the local's __dict__. Thus the Weeper is deleted at the line getattr(local, 'whatever', None), after the thread dies, and Weeper.__del__ runs on the main thread. Exception AttributeError: "'NoneType' object has no attribute 'get_ident'"
Without getattr, the Weeper isn't deleted until interpreter shutdown. The shutdown sequence is complex and hard to predict—in this case the thread module has been set to None before the Weeper is deleted, so Weeper.__del__ can't do thread.get_ident(). 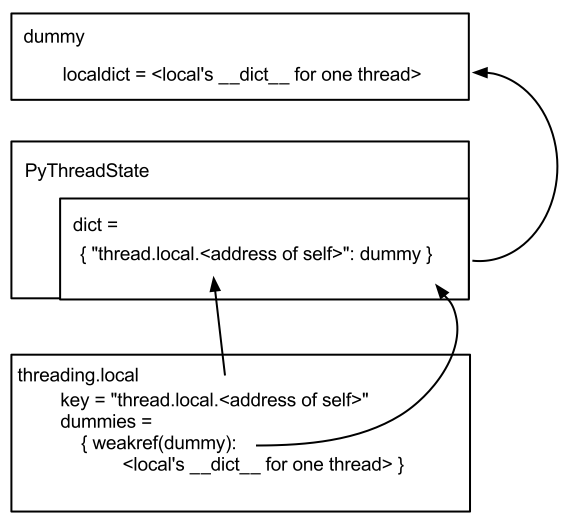 To understand why locals act this way in Old Python, let's look at the implementation in C. The core interpreter's PyThreadState struct has a dict attribute, and each threading.local object has a key attribute formatted like "thread.local.<memory address of self>". 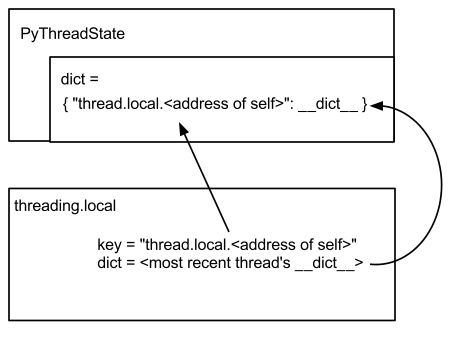 Each local has a __dict__ of attributes per thread, stored in PyThreadState's dict with the local's key. threadmodule.c includes a function _ldict(localobject \*self) which takes a local and finds its __dict__ for the current thread. _ldict() finds and returns the local's __dict__ for this thread, and stores it in self‑>dict. /* The call to tp_init above may have caused another thread to run. I've edited for brevity. There's a few interesting things here—one is the check for a custom __init__ method. If this object is a subclass of local which overrides __init__, then __init__ is called whenever a new thread accesses this local's attributes for the first time. But the main thing I'm showing you is the two calls to Py_CLEAR(self‑>dict), which decrements self‑>dict's refcount. It's called when a thread accesses this local's attributes for the first time, or if this thread is accessing the local's attributes after a different thread has accessed them—that is, if self‑>dict != ldict. The worker thread stores a Weeper in local.weeper. _ldict() creates a new __dict__ for this thread and stores it as a value in PyThreadState‑>dict, and stores it in local‑>dict. So there are two references to this thread's __dict__: one from PyThreadState, one from local. The worker thread dies, and the interpreter deletes its PyThreadState. Now there's one reference to the dead thread's __dict__: local‑>dict. Finally, we do getattr(local, 'whatever', None) from the main thread. In _ldict(), self‑>dict != ldict, so self‑>dict is dereferenced and replaced with the main thread's __dict__. Now the dead thread's __dict__ has finally been completely dereferenced, and the Weeper is deleted. The bug is that _ldict() both returns the local's __dict__ for the current thread, and stores a reference to it. This is why the __dict__ isn't deleted as soon as its thread dies: there's a useless but persistent reference to the __dict__ until another thread comes along and clears it. In New Python, the architecture's a little more complex. Each PyThreadState's dict contains a dummy for each local, and each local holds a dict mapping weak references of dummies to a per-thread __dict__. When a thread is dying and its PyThreadState is deleted, weakref callbacks fire immediately on that thread, removing the thread's __dict__ for each local. Conversely, when a local is deleted, it removes its dummy from PyThreadState->dict. This whole weakrefs-to-dummies technique is, apparently, intended to deal with some cyclic garbage collection problem I don’t understand very well. I believe the real reason why New Python acts as expected when executing my script, and why Old Python acts weird, is that Old Python stores the extra useless reference to the __dict__ and New Python does not.